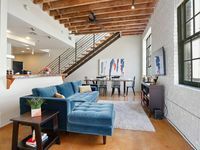 Properties in Arts-Warehouse District average 4.6 out of 5 stars. FRENCH QUARTER - WAREHOUSE DISTRICT - CONVENTION CENT - LUXURY HOME - NEAR ALL! Property 13: FRENCH QUARTER - WAREHOUSE DISTRICT - CONVENTION CENT - LUXURY HOME - NEAR ALL! 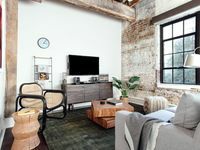 Cozy 2 Bedroom 2 Bath Modern Bohemian Condo. Perfect Location to experience New Orleans at it's finest! Property 36: Cozy 2 Bedroom 2 Bath Modern Bohemian Condo. Perfect Location to experience New Orleans at it's finest! Ideal location from convention center and French Quarter. Would definitely return! I thought the proximity to the highway would be our noise problem. I was WRONG - it was generic city-noise. And if you're staying near the French Quarter, there's no place that doesn't have it. Earplugs and noise machines were provided - noise was literally a non-issue. Bedrooms were BRIGHT, especially after a night on Bourbon Street, due to facing the morning sun; however, I'm giving 5/5 instead of 4/5 because the owner is aware of this now, and I've seen zero evidence that they won't address the issue soon. Everything was exactly as-advertised, and the checkin-checkout was a breeze. Would 100% rent again through this company, and if you choose this spot, go check out The Rusty Nail right next door. Great little spot with an amazing patio to &quot;escape&quot; the city for an hour when it becomes a bit much.